In Auntie Yang’s Great Soybean Picnic, a young Chinese girl and her sister love visiting their Auntie and Uncle Yang’s home. One weekend, on a Sunday drive among the cornfields near Chicago, they discover soybeans growing and have their very first soybean picnic. Every year after that, Auntie Yang invites more people to share the food and fun and pretty soon more than two hundred friends and neighbors are gathering at the picnic to play games and eat soybeans together. 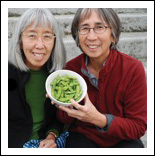 In this booktalk, sisters Ginnie and Beth Lo discuss their childhood memories, love for soybeans and how they came up with the ideas for their book. Both of you have taught on the college level as professors. How has teaching influenced you as a writer and an illustrator? Ginnie Lo: Teaching and research (including grant writing) has influenced my writing by training me to carefully wordsmith every sentence for both clarity and musicality. Whether I’m writing a scientific research paper or children’s book, I always read each paragraph out loud and think about it most analytically and intuitively. Beth Lo:Teaching art is a wonderful profession. You get to work in close contact with creative minds, both young and old. One of my favorite parts of teaching is coming up with projects and assignments in my ceramics and drawing classes. Assignments need to be specific enough to spark an idea but open ended enough to allow for individuality from the students. Illustration work often feels like working within the limitations of a class assignment. And sometimes I can assign projects that are within my own interest range in subject matter or technical arena. The students actually carry out my own research. Beth, how did you come up with the idea to draw the illustrations on ceramic plates? Can you describe the process that went into creating the illustrations? BL: It's really simple: I know the medium of ceramics much better than I know paint or colored pencil. I know how to apply the surfaces, and I know how the colors work. When I have worked in other media I have found it hard to erase or correct the images. On clay I can just scrape off the layer of color and start over. I like using plates as my painting surface because of the long tradition of drawing on plates and the connection to food service. Auntie Yang’s Great Soybean Picnic is based on the childhood experiences you both had growing up in the Midwest. When working on this book, what helped you remember details about things that occurred many years ago? GL: We always reminisce with our cousins, parents, aunts, and uncles when we get together for family reunions, so working on this book was not so different from just being with family. Digging up the old photos from soybean picnics of the past helped jog my memory about details, but mostly the book just flew from my memory to paper. BL: Ginnie and I often talk about our childhood, and after we started the project we would reminisce quite informally about the soybean picnics with our mother, cousins and old friends. One cousin, Allen Yang, came up with a lot of old photos! What is the best way to self-edit your work? GL: Read your work out loud to yourself and to selected audiences. BL: Work fast and intuitively, put the work away, then look at it later and see how it affects you. Get feedback if you like, then make changes that seem necessary. Put it away again. Set a deadline for a “final” and hope for the best! I work quickly and spontaneously, drawing out my ideas in thumbnail sketches. Then I do more detailed drawings, using Internet resources for specific images. I put in the necessary information, then at the end try to balance the composition with color. When your children were young, were they reluctant eaters? If yes, how did you persuade them to eat their vegetables? GL: We didn’t really have any problems with our kids eating vegetables. Maybe we added grated cheese to some veggies. BL: My son loved vegetables and was a great eater most of the time. Are there any funny stories from your memories of the soybean picnics that did not make it into the book? BL: As children and teenagers, early each August we attended an annual weeklong Chinese Family Camp located in upstate Indiana. Many of our Chinese American friends from the region attended, and right after camp was over we would begin planning to see each other again at the annual soybean picnic. It was often the highpoint of the early fall. How should one prepare to host a giant picnic? GL: Start preparations days in advance, and get a lot of help from family and friends. Don’t forget to appoint a clean-up crew!! BL: Many foods can be made in advance and kept frozen or refrigerated in anticipation of the great day. We would clean, set out tables, folding chairs, signs. To let people know ahead of time, we would write letters and make phone calls in advance! There was no email or Facebook in those days! If readers are traveling to the Midwest, what should they put at the top of their lists to see? 1. Chicago Art Institute 2. Chicago Millennium Park 3. Off the beaten track: Indiana’s Turkey Run State Park; this was our favorite hiking destination as kids. It is the Midwest’s version of slot canyons where you hike in a gorge and wade in water along the way. BL: That’s a tough question! If I were going to Chicago, I would say Millennium Park, the Art Institute, the Museum of Natural History, the Field Museum, and Chinatown! In Indiana, I used to love to go to the state parks like Turkey Run, which have interesting rock formations and little waterfalls. And of course the farmland: corn, corn, corn! And soybeans!!! One of the themes in Auntie Yang’s Great Soybean Picnic is that food brings people together. Today, people often do not to pay attention to their dining companions because of distractions like smart phones. What do you think is the best way to combat this problem? Ban smart phones and cell phone from the dinner table. Tell jokes around the table. Talk about the food: how it was prepared, ingredients, and interesting stories about the specific dishes being served. BL: Some families have rules—no cell phones at meals etc. I think that if you get the kids involved in making the food they will enjoy celebrating the eating of it as well. And parents can practice asking questions at the dinner table, telling interesting or funny stories, and being good listeners too. Can you recall how many times you picked up a pod and discovered four or more soybeans nestled inside? GL: I can’t recall how many times, but I remember it was an exciting discovery. We disliked the single bean pods. I’ve noticed that today, all the pods have exactly three beans. How sad. BL: Our family always had competitions going on: who could eat the most wontons, who had the biggest bowl of rice. So we were always comparing who got the biggest soybeans! Besides soybeans, what are some of your other favorite Chinese foods? GL: Sweet and sour spareribs made by Auntie Shu, my best friend’s mother. Fish flavored eggplant—a greasy, spicy, slimy dish. BL: That’s another hard question because there are so many favorites! We put many of our favorite dishes into the story. I love all kinds of stir fry: mapo tofu, twice cooked pork, pork and cauliflower, green beans with garlic, all kinds of dumplings and dim sum. Fish with scallions and ginger, Chinese crab and shrimp. Yum! What is your favorite way to cook and/or eat soybeans? RD: I like them just plain, boiled, hot or cold. And I use the beans in several stir-fry dishes including mapo tofu and fried rice with Chinese sausage, egg, peas, and soybeans. Can you tell us about any upcoming projects you're excited about? What’s for Chinese Breakfast? compares the strange foods our grandparents’ generation ate to what American-born Chinese children eat for breakfast, lunch, dinner, and dessert. Rhymes for Good Chinese-American Children is a series of rhymes poking fun at the stereotypically perfect Chinese child. It’s a humorous response to the Tiger Mother syndrome. BL: I have several exhibitions of my ceramic sculpture and pottery coming up this fall, in St. Louis, California, Philadelphia, Nevada. I am also interested in learning about glass. And we also hope to travel again to China to see our relatives.